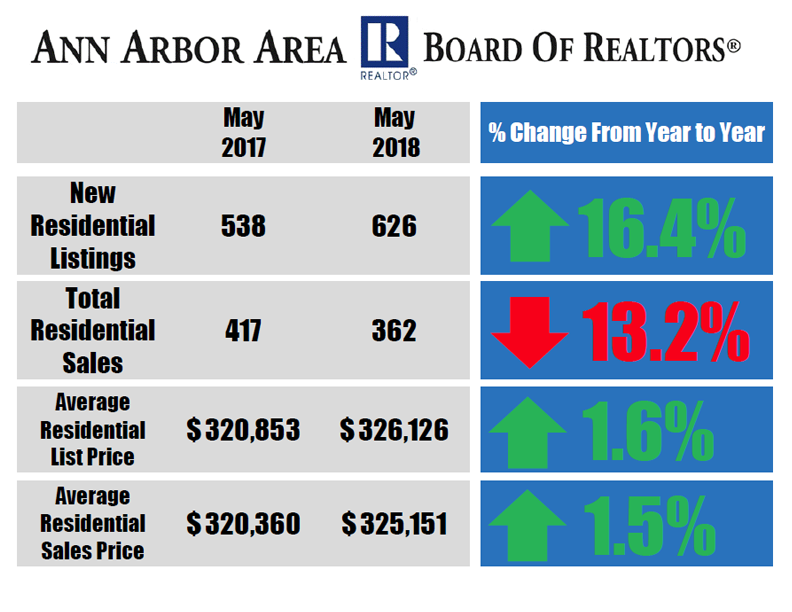 The number of new residential listings continue to rise after months of being lower compared to 2017 numbers, according to data released by the Ann Arbor Area Board of REALTORS®. The number of new residential listings is up 16.4% from 538 new listings in May 2017 to 626 new listings in May 2018. Total residential sales are down 13.2% compared to May 2017, however the number of residential sales for May 2018 are up 19% from last month, April 2018. The average residential list price is up slightly at 1.6% from $320,853 in May 2017 to $326,126 in May 2018. Average residential sales prices are also up 1.5%, with the average sales price for May 2018 being $325,151, compared to an average of $320,360 in May 2017. Single family homes continue to sell quickly, with an average of only 28 days on market, compared to 35 average days on market in May 2017. In addition, 48% of single family homes sold above list price and 16% at list price in May 2018. To see more Ann Arbor Area housing statistics, view the May 2018 Housing Statistics Report.